I've been looking forward to Valentine-making season for quite awhile now because it is the perfect time to play with one of my very favorite animal sets "Cuddles and Hugs"! Today I'm using the koala, I got a TON of requests in the past couple days to see these little fellas colored, which has me thinking many of you are a little leery of coloring "fur", am I right? It's not hard, but different than that blended Copic look you've probably been trying to achieve for smooth objects. Let's start with a pic of the real thing, shall we? If you have access to the Internet, you have images, from multiple views and poses, of practically anything you need to color! This is really helpful for selecting shades and figuring out shadows. I'm only using 3 markers for this today: W-1, W-3, and W-5, three shades of Warm Gray. While some areas of the real koala have this warm "yellower" gray color, others are a cool silvery gray, which I have in my Copic collection, but these are better for my DP and CS I'll be using. First I'm putting in some feathered lines with W-3 in the areas that will eventually be the darkest so you can see where to concentrate the most color: around the ears, and the underside of their arms, legs and back. you make these little stokes quickly, with just the very tip of the brush tip end, it will make the finest of lines when you want. Now I went and filled in the rest of the body with these same little strokes for hairs, working in on direction mainly on the limbs so the hair seems to follow the arm or leg down, and working outward on areas like the face starting from the eyes. be sure to leave room between the strokes so the white can show through. I left the tummy and chin area completely white. 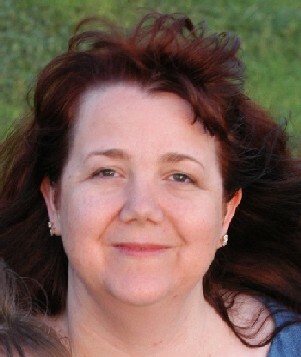 Now I'm going in with my W-1, that palest gray in small circles to blend over the hairs, not the Colorless Blender. This will bring all the colors together and keep the fur from looking "patchy". After blending, I went back in with just a few strokes of my W-5 again to make a few of the details (like the tufts at the ears) a little sharper. Aren't they huggable?? And here is my finished card! I used the So Sketchy December Square Card Sketch, Basic Grey Cupcake DP and Sahara Sand for my base, as you can see these warm grays look really nice with that CS.. I added a few halfback pearls, the threading water punch on my border to match the scallops on my heart punches. "Hugs and kisses" is also from the "Cuddles and Hugs" set. If you don't have Copics, try coloring your koalas the way I did in this sample, and/or this sample! Hope this gave you some warm fuzzies!! Have a great day! Thanks for sharing your coloring. I have copics on my wish list...and maybe one day I will get to try and use them. Very cute. I can only dream of owning copics, but I love learning anyway!! Thanks for sharing this Koala color tutorial. I'm wondering if I can approximate it with my SU markers and blender pen? The shading ideas should give me lots to work with. I've always been unsure how to get a textured look to the work and your idea of looking at lots of real pictures and your analysis of the makeup of the fur makes the shading ideas make sense (unlike this comment I'm thinking - lol!). Can't wait to see what else you come up with this year. Blog candy or no yours is a must view site! ps. have you ever noticed how bizare some of the word verifications come up - mine tonight looks like it says "no initiative" - not sure what I think about that - a bit too much like chinese fortune cookies! Super duper cute card Melanie!!! That koala is one of my all time favs! Love your card and thanks for showing us how to color with the copic. If Gina starts a club I am going to join so I can get some. thanks for all your hard work in showing us how to do it. The fur looks great. 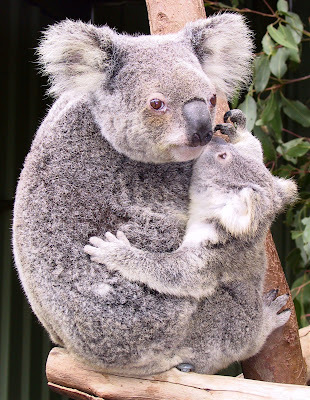 I am so glad you didn't call it a Koala bear like so many people wrongly do,lol. I love all of your blog entries and eagerly await them. I really enjoy your coloring tutorials. Even though I don't have Copics, I've learned a lot to use with my SU markers. They were expensive enough, so I'll have to wait until I can rationalize another big investment. Thank you for sharing this tutorial! I love the card. You're right, Mel. Fur can be scary. Thanks for sharing this tutorial. Thank you for showing us how to color animals. Thanks for the great tutorial! I just got my first few copics this week! You hit the nail on the head - fur how to colour it, well thank you for showing how!! copics are on my list of buy and my birthday is nearing! Beautiful! Thank you for the tutorial. Copics are great, aren't they? Thanks for the tutorial! this card is fantastic!! Thanks for the cute tutorial! You describe the steps so well you make me think, "I could do that too!" Great card sample, I love that dp. Beautiful card and your coloring is amazing. I'm one of those that stampers that hope to own some copic one day. Thanks for the inspiring eye candy. wow! they look so snuggly soft! adorable!! They are adorable! Love your card and the tutorial was great! Thank you. Melanie, your fuzzy critters on the card are as adorable as the real thing in the picture you posted. Thanks for sharing a tutorial on coloring animals. I usually don't use a lot of animal stamps because I struggle with coloring them. You make it look easy. Thanks for the great tutorial Melanie! Your Koalas are so cute! Thanks so much for the tutorial. I love the card! I can't wait to get my set in the mail! Very nice job - they do look fuzzy! Girl..you are amazing with those copics! You matched them very well. Fabulous tutorial! Love the card. Thanks again for a great tutorial. Your card is sooo cute & the coloring details are awesome. I would also love to see some butterfly tutorials in the future, too. Your coloring looks fantastic, and I just love your adorable card!! Oh my goodness, thanks so much for sharing your coloring technique. I am not very creative in my coloring. I have not purchased copics yet, because I was not exactly sure how to use them...but thanks to your demo I will soon give it a try. Love this little guy. Thanks for sharing and happy stamping. Thanks for sharing how you did this coloring. NOW I just need some copics of my own LOL. You are amazing. I want to give that little koala bear a hug. Thank you for sharing the tutorial. I have such a hard time coloring with the Copics. I know there is a learning curve and I have to sit down and play with them some more. These tutorials are really helpful in getting me started and motivated! I have never used Copics before so I am super excited to see these in action. Keep it coming so I can see more of your beautiful eye candy. awww, sure looks cuddley to me! Fantastic coloring! hope this works...I cannot get a comment to stay here!! Your coloring is like works of art...I hope someday I can "color" like you when I finally own one or two copics! I have saved your emails so someday I will be able to try and re-create your work! Thank you so much for this tutorial on using Copics to make "fur" on animals. I've always wanted to know how one does that in any medium, but especially Copics now that I own a set! Keep those coloring tutorials coming! I'm copying every one so I have it handy! Will have to give this a try...don't have the Copic markers, but will practice with the markers I do have...Copics on my wish list. Thanks for sharing your expertise. That is such a cute, cute card!!! And THANK you for such a wonderful, visual tutorial!!! That realllllllly helps me tons!!!! Adorable! Your coloring on the koalas is awesome! They're so cute.